Work by students at a Haverhill college on a police anti-drugs project has gained local and national recognition. Suffolk Constabulary’s schools drugs project, developed by students at Castle Manor Business and Enterprise College, won two awards at a ceremony in Bury St Edmunds last night. Don’t Let Drugs Wreck Your Life won the High Sheriff’s Crimebeat Award, and was also commended at the National Crimebeat Awards. The educational programme looks at issues surrounding drugs and alcohol and their effects on health and wellbeing, personal safety, citizenship and personal and social development. 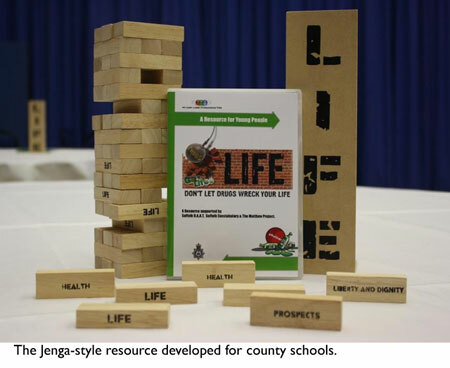 The concept was developed by pupils from the college following a competition run by Suffolk Constabulary under the umbrella of the Suffolk Drug and Alcohol Action Team, and shows a wrecking ball swinging into a wall with the word ‘Life’ written on. This idea has been developed into an interactive teaching resource in the style of ‘Jenga-style’ blocks, with the word ‘Life’ written down the side. On individual blocks are discussion topics such as relationships and health. The tower demonstrates that if these things are taken away, it becomes a less strong and safe structure and is designed to provoke discussion in young people. Accompanying the tower are two DVDs, the first an instructional DVD and the second an 18-minute long programme about drug misuse, which is split into segments suitable for a class of ten to 12-year-olds and 12+, both of which were produced by East Coast Productions. The team were presented with their awards by the High Sheriff, Stephen Miles, at St Edmundsbury Cathedral. Each year, the High Sheriff makes awards to non-profit groups working for the benefit of the people in Suffolk and gives recognition to those who are tackling local problems and giving of their time and effort voluntarily. The winner of the local Crimebeat Award is put forward to the National Crimebeat Awards. Suffolk Constabulary’s Chief Constable, Simon Ash, said: “The hard work of the students at Castle Manor continues long after the original young people who began the project left school. Each year a new set of pupils takes on Don’t Let Drugs Wreck Your Life as custodians to develop the scheme further. “We have now seen the DVD and other educational material go to all upper schools in the county and there has been interest from around the country too. The national Crimebeat commendation also received is highly deserved and I would like to thank the team for all their hard work on this innovative and successful project. Five projects represented the constabulary. Alongside Don’t Let Drugs Wreck Your Life, anti-knife campaign Bin A Blade was highly commended in the Crimebeat category. Mr Ash said: “I am delighted that Bin a Blade has been recognised, now we have completed the year-long knife amnesty and binned over 6,000 knives. 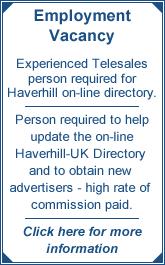 Bin a Blade came to Haverhill a year ago for two months.